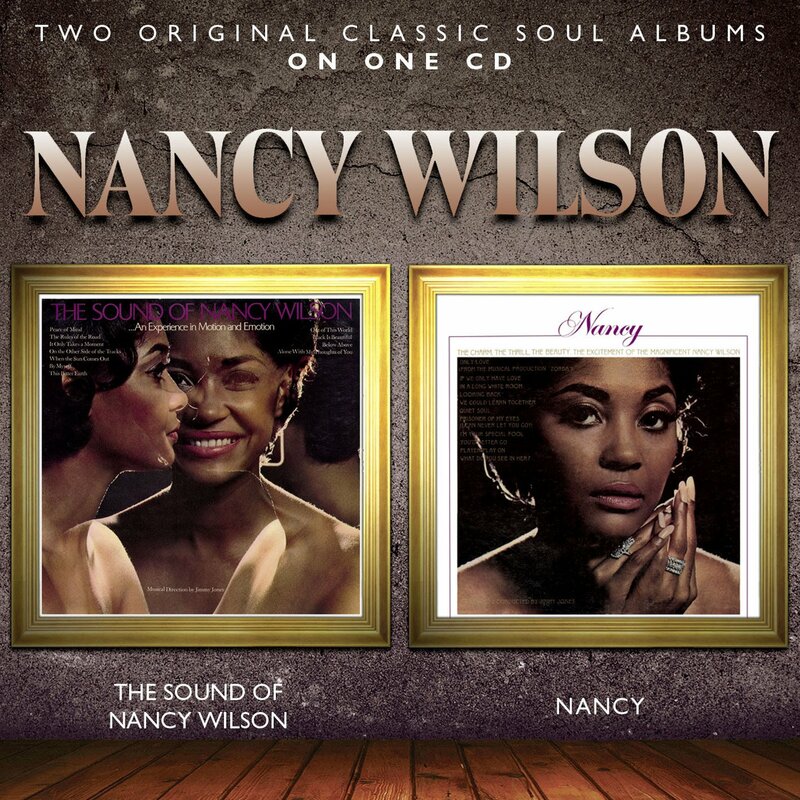 NANCY WILSON-THE SOUND OF NANCY WILSON AND NANCY. Eight years and over a dozen albums after Nancy Wilson released her debut album Something Wonderful in 1960, she was now one of the biggest draws in jazz music. She was hailed as the “heir apparent to Ella Fitzgerald by Time Magazine” in 1964, the year she won her first Grammy Award. Over the next three years, her spellbinding performances enthralled listeners. Nancy Wilson’s shows were now one of the hottest tickets in town. Meanwhile, Nancy was broadening her horizons. Seemingly not content with a career in music, Nancy embarked on an acting career. During the mid-sixties, Nancy appeared on The Killers, Burke’s Law, The Red Skeleton Hour and I-Spy. Then in 1967, Nancy Wilson became one of the few singers to host their own television shows. However, music was where Nancy Wilson made her name. In just seven years, she’d become one of the world’s top jazz singers. That in some ways was the easy bit. The hard part was staying there. While Nancy tried her hand at acting and had her own television show, she was wasn’t neglecting her recording career. Quite the opposite. She remained a prolific recording artist. During 1968 she released The Sound Of Nancy Wilson and in 1969, released Nancy, which were recently reissued on one CD by SoulMusic Records. Would The Sound Of Nancy Wilson and Nancy ensure Nancy remained one of the world’s top jazz singers? Was Nancy worthy of inheriting Ella Fitzgerald’s crown as the First Lady Of Music? THE SOUND OF NANCY WILSON. Music, society and indeed the world were very different from when Nancy released her debut album. In 1968, when she started work on The Sound Of Nancy Wilson, The Vietnam War was raging, while the civil rights movement was determined to bring about equality in America. Then in April 1968, tragedy struck. Dr. King was assassinated. Meanwhile, The Age of Aquarius continued, while Jimi Hendrix, The Beatles, Cream, The Grateful Dead provided a psychedelic soundtrack for a new generation. This new generation perceived Nancy’s music as cocktail jazz, that was safe and inoffensive. To them, it was neither innovative nor socially relevant. Despite this, there was still a healthy appetite for artists like Nancy Wilson. Indeed this audience was bigger than ever. Now that Nancy had a network television show The Nancy Wilson Show meant every American home was exposed to her music. This could really increase her popularity. To do this, Nancy and her producer David Cavanaugh stuck to their winning formula for albums. They’d use this formula before successfully, and would do so again on The Sound Of Nancy Wilson. Their winning formula was to combine cover versions, standards and new material. Familiar tracks on The Sound Of Nancy Wilson included Out Of This World, When The Sun Comes Out, The Other Side Of The Tracks and Black Is Beautiful. Cy Coleman and Carolyn Leigh who penned The Other Side Of The Tracks, also contributed The Rules Of The Road. Arthur Schwartz and Howard Dietz cowrote By Myself and Gail Fisher and Oliver Nelson penned Below, Above. Other tracks included Jerry Herman’s It Only Takes A Moment and Ronnel Bright’s Alone With My Thoughts Of You. Having carefully chosen the material for The Sound Of Nancy Wilson, Nancy headed into the studio with producer David Cavanaugh. For the recording of The Sound Of Nancy Wilson, Capitol Records didn’t scrimp on the musicians accompanying Nancy. No wonder. After The Beatles, Nancy was Capitol’s most successful artist in America. So, a full orchestra was brought in to accompany Nancy. A woodwind, horn and string section joined the rhythm section in providing the accompaniment to Nancy’s vocals. Would the expense incurred by Capitol for The Sound Of Nancy Wilson be worthwhile? Choosing the right track to open an album is always crucial. Nancy’s choice of Out Of This World is perfect for The Sound Of Nancy Wilson. It allows Nancy to showcase her inconsiderable vocal prowess. Accompanied by punchy, rasping horns, Nancy mixes power, control and emotion. In doing so, she demonstrates her jazz pedigree. Building and building, to a dramatic crescendo, it’s a truly irresistible way to open any album. A much more reflective and almost melancholy Nancy features on This Bitter Earth. Accompanied by a slower, understated arrangement that mixes jazz and blues, Nancy takes care with the lyrics. She delivers them to get maximum effect. As for the arrangement, like a flower, it gradually blossoms and grows. Nancy’s delivery is thoughtful and wistful. Her use of space adds to the poignancy and potency of the lyrics. Be Myself is driven along by a standup bass, piano and bursts of braying horns. Again demonstrates Nancy’s ability to make the lyrics about the breakup of a relationship come to life. From the heartbreak and hurt, to the bravado and defiance that fills her voice, Nancy’s portrayal of the lyrics is realistic and deeply moving. The heartbreak and sadness continues on When The Sun Comes Out. Again, Nancy brings out the subtleties and nuances of the lyrics. She’s accompanied by an understated, wistful and vintage sounding arrangement. Like so many other arrangements, it sounds as if it belongs on an album from the fifties not sixties. Despite this, it demonstrates that in the sixties, Nancy was one of the great jazz vocalists. Despite Alone With My Thoughts Of You seeing the tempo increase, Nancy’s heartache and hurt remains. Her vocal is slow, rueful and emotive, drifting in and out of the jaunty, shuffling arrangement. It’s the perfect foil for her captivating and compelling vocal. This is the case with It Only Takes A Moment. From the opening bars, the drama builds. Elements of gospel, jazz and soul combine as Nancy kicks loose. Her vocal veers between power and passionate to seductive and sultry. Peace Of Mind sees a similar combination of jazz, soul and gospel combine as Nancy seeks for that elusive Nirvana. Fusing emotion, sincerity and raw power, a different side tp Nancy emerges. Almost bursting into life, The Other Side Of The Tracks is propelled along by the rhythm section, percussion and blazing horns. Having set the scene, Nancy literally struts her way through the track, injecting sass and swing into an old standard. The polar opposite is Below, Above, a heartbreaking tale of love that’ll never be. Here, Nancy’s skills as a storyteller come into their own, while the understated, but dramatic arrangement helps paint evocative pictures. The Rules Of The Road has a real late-sixties jazz sound. Nancy’s languid vocal is sensual and sassy, while the arrangement has a slightly more contemporary sound. Stabs of horns, bursts of drums and jazzy guitar punctuate the arrangement as Nancy delivers one of her best vocals. Black Is Beautiful also has a subtle, contemporary sound. This allows Nancy’s slow, emotive and strident vocal to bring out the meaning in the lyrics. Written at the height of the civil rights movement, the lyrics are filled with hope and pride, and without doubt, result in the most powerful song on The Sound Of Nancy Wilson. Released in 1968, the music on The Sound Of Nancy Wilson sounded as if it belonged in the fifties. Blessed with a vintage jazz sound, this type of music was no longer as popular. This was reflected in the album and single sales. It seemed Nancy’s music had to evolve. If it didn’t, then her music would cease to be relevant. For Capitol Records, this was a huge problem. Apart from The Beatles, Nancy was Capitol’s most successful artist. So, if Nancy’s popularity declined, the label’s finances would suffer. However, transforming an artist’s career who still had a large, albeit declining following was risky. You could end up alienating the artist’s existing fans. The last thing any label wanted was a warehouse full of unsold albums. So, what had to happen was rather than a sudden transformation, gradually, the music had to evolve. This would result in Nancy’s music being given a makeover, without forgetting about her roots. What she really needed was an album that combined her vintage jazz sound with a more contemporary sound. The result was Nancy. Between the release of The Sound Of Nancy Wilson and Nancy in 1969, Nancy hardly stopped recording. She released three albums, 1968s Easy and Son Of A Preacher Man and Hurt So Bad in 1969. These three albums saw Nancy’s fortunes vary. Easy had proved a much bigger success than The Sound Of Nancy Wilson. Not only did it reach number fifty-one in the US Billboard 200 and number five in the US R&B Charts, but featured Nancy’s biggest hit single in four years Face It Girl It’s Over. Son Of A Preacher Man wasn’t as successful, stalling at number 122 in the US Billboard 200 and number twenty in the US R&B Charts. Hurt So Bad marked a slight upturn in Nancy’s fortunes, reaching number ninety-two in the US Billboard 200 and number nineteen in the US R&B Charts. For what would be Nancy Wilson’s last album of the sixties, she needed and wanted to end the decade on a high. Sticking to what recently, had hardly proved a winning formula, Nancy featured a mixture of the familiar and new songs. Among the familiar faces, were Only Love (From Zorba), You’d Better Go, What Do You See In Her and We Could Learn Together. These songs, it seemed, were perfectly suited for Nancy. So too was I’m Your Special Fool and Look Back. Nancy could breath life, meaning and emotion into these songs. Heartfelt to heartbroken Nancy scales the whole gambit of emotions on Nancy. Assisting her are an orchestra conducted by Jimmy Jones, while David Cavanaugh takes charge of production on Nancy. Would Nancy rejuvenate the career of Nancy Wilson? The answer to that is no. Nancy only reached number 117 in the US Billboard 200 and number thirty-eight in the US R&B Charts. In A Long White Room failed to chart. A small crumb of comfort was it reached number thirty-one in the Adult Contemporary charts. You Better Go fared better, reaching number forty-four in the US R&B Charts. It seemed the commercial success that Nancy enjoyed a few years earlier, was starting to elude her. Had she lost her Midas Touch? That’s what I’ll tell you, once I’ve told you about the music on Nancy. I’m Your Special Fool opens Nancy. It has a a poppy sound. There’s an urgency in Nancy’s voice, while cooing harmonies help the rhythm section and horns drive the arrangement along. Later, Nancy using her full vocal range, unleashes a powerful vocal, as her music heads in a new direction. This continues on Prisoner Of My Eyes, where the tempo drops. With just piano, rhythm section and later, rasping horns for company, Nancy’s vocal is pensive and tender. Mixing soul, jazz and what could be described as Adult Contemporary, her vocal is heartfelt, sincere and sensual, while the arrangement provides the perfect accompaniment. If the previous two tracks were examples of Nancy’s music evolving, Player Play On is a return to Nancy’s usual style of music. Written by actor Tony Curtis, it’s far from one of the highlights of Nancy. Sounding not unlike Marlena Shaw, Nancy tries her best to make the song work. Despite her best efforts, the song lets her down. In all honesty, Tony Curtis proves a better actor than songwriter. One of the most familiar tracks is Only Love, which features in the movie Zorba. Nancy’s reading of the lyrics is moving and powerful. Slow, dramatic and emotive, swathes of strings and harpsichord accompany Nancy’s vocal resulting in a quite beautiful track. Looking Back continues the reinvention of Nancy. There’s a soul jazz sound to the track, which takes on a smokey, late-night sound. Key to this are a Hammond organ, guitar and braying horns. This is perfect for Nancy. Spurred on, she breathes emotion, sadness and a sense of melancholia to the song. Flourishes of urgent strings open If We Only Have Love. They provide a dramatic backdrop for Nancy’s vocal. Bursts of horns and woodwind punctuate the arrangement as it heads towards its dramatic climax. It doesn’t take carbon dating or a D.N.A. test to work out the age of In A Long White Room. Quite the opposite. There’s a real late-sixties sound to the song. Pop, soul and jazz are fused, while the arrangement has an unusual time-signature. Veering from smooth to edgy and jumpy, it continues what is an eclectic album. You’d Better Go was a cover of a track made famous by Anthony and The Imperials. Here, Nancy accompanied by sweeping harmonies, mixes pop, soul and jazz, transforms the track whilst delivering a pleading, heartfelt vocal. Quiet Soul is the perfect track to follow You’d Better Go. Just an understated arrangement allows Nancy’s crystalline, tender and beautiful impassioned vocal to take centre-stage. What Do You See In Her has a similar understated arrangement. However, it has a vintage jazz sound. Horns blaze while a piano and bass meander and wander across the arrangement. Meanwhile, Nancy feisty, frustrated and angry asks What Do You See In Her? Closing Nancy is We Could Learn Together. It’s an uptempo track with a jaunty arrangement. Drawing inspiration from soul, jazz, pop and country, Nancy’s vocal veers between languid, powerful and heartfelt. As her vocal grows in power, she probes and suggests, We Could Learn Together. Three albums after the release of The Sound Of Nancy Wilson, Nancy was released. To some extent, it brought Nancy’s music up to date. It still contained her trademark sound. That hadn’t been dispensed with. Doing that, would risk the wrath of Nancy’s fans and warehouses filled with unsold albums. That wasn’t the case. Nancy was an eclectic album, where jazz, soul, pop, gospel and blues combined head on. Mixing the “old” and “new” sides of Nancy Wilson, the idea was to win back fans who’d become tired of what was perceived an outdated sound. It was also meant to win over a new generation of fans. This it didn’t do. Nancy was less popular than her previous album. Still it seemed, Nancy’s music wasn’t winning over a new generation of music lovers. Maybe that’s not surprising. Jazz was no longer the force it once was. Psychedelia, rock and pop provided the soundtrack to a generation. Nancy’s music was perceived as the music their parents listened to. To them, it belonged in another era and wasn’t socially relevant in an era of heightened political and social awareness. Music either was or wasn’t fashionable. In the anything goes, swinging sixties, that didn’t extend to music. The exception was if an artist was endorsed by one of the “stars” of the day. Muddy Waters and Howlin’ Wolf’s careers were given a boost by the patronage of The Beatles and Rolling Stones. Sadly, their patronage didn’t extend to one of Nancy Wilson. While she didn’t inherit Ella Fitzgerald’s crown as the First Lady Of Music, she is one of the greatest jazz singers in the history of music. Standout Tracks: The Rules Of The Road, Black Is Beautiful, You’d Better Go and What Do You See In Her. ← THE O’JAYS IN PHILADELPHIA.